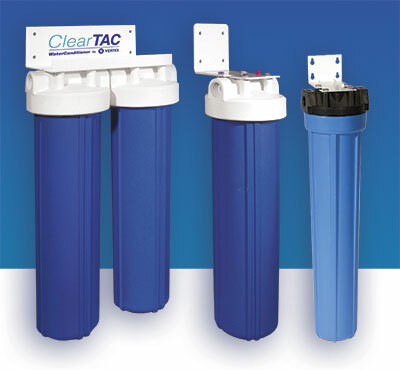 Ideal for Coffee Machines, Ice Makers, Drinking Fountains and Tankless Water Heaters, the ClearTAC cartridge systems use Template Assisted Crystallization technology to reduce hard-water deposits from forming on pipes and fixtures at the Point-of-Use. Can be used in areas where conventional water softeners are banned. ClearTAC prevents scale build-up by transforming the hardness minerals into undissolved crystal micro-particles. These crystals are suspended in the water and stay in solution so they don’t deposit on faucets and pipes. 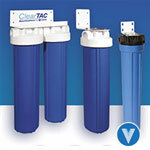 The ClearTAC passes DVGW-w512 standard for physical water treatment (PWT) devices, and two independent lab tests confirm our own results at the Vertex lab of 90% or more effectiveness in reduction of scale build-up. The VERTEX ClearTAC POU systems use Template Assisted Crystallization technology to reduce hard-water deposits from forming on pipes and fixtures at the Point-of-Use. This advanced water treatment device can be used in areas where conventional water softeners are banned. Economical and Eco-Friendly, no energy, chemicals or salts are used and there is no brine discharge.